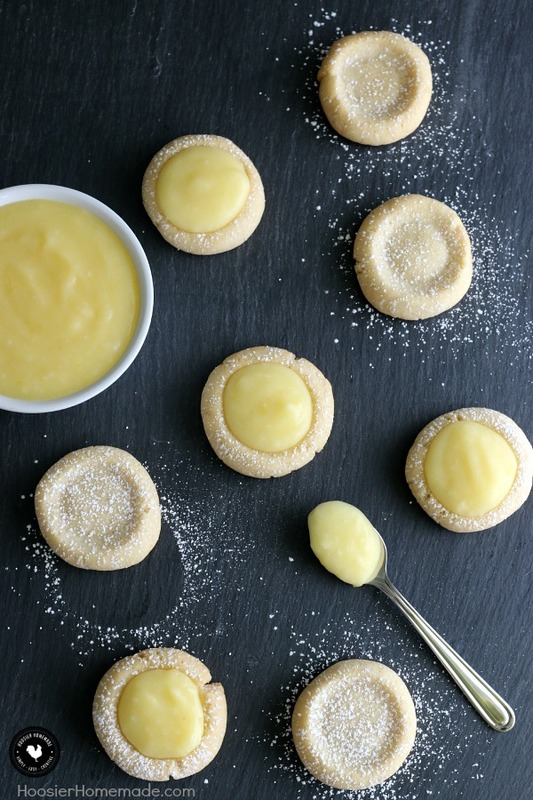 These buttery cookies filled with homemade lemon curd are the perfect Spring treat! 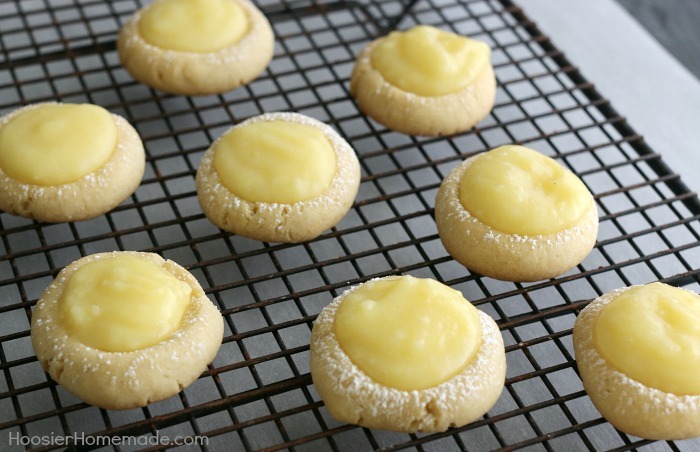 Serve these Lemon Drop Cookies with your Easter dinner, a Spring baby shower or a delicious treat for a weeknight dessert. 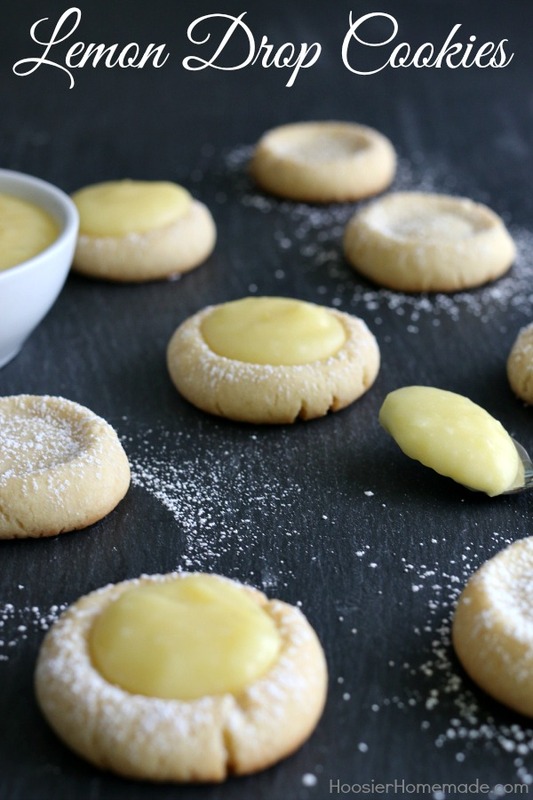 The lemon curd in these cookies taste similar to Lemon Drops. Do you remember those lemon shaped candies? They are so delicious, and give you that little punch of sour right behind your ear. You know what I mean, when it’s so sour it makes you twinge a little. But so delicious you can’t stop eating them! These cookies start with a basic butter cookie. A simple mixture of butter, flour, an egg yolk, vanilla, and salt. Instead of sugar, I used Truvia Baking Blend, it’s a sugar substitute blend of zero-calorie Truvia natural sweetener and sugar then packaged in a product that’s designed for easy, at-home baking. It also can be substituted for sugar in any recipe by simply using half as much Truvia Baking Blend as you would sugar. The Homemade Lemon Curd has lemon juice and zest from 2 lemons, eggs, butter, and again Truvia to cut back on the calories. This time though I used Truvia Spoonable Natural Sweetener. The lemon curd does pack a punch of flavor, so you can certainly add a little more Truvia to suit your taste. The mixture is cooked on the stove and comes together in about 10 minutes. The key to know when it’s done is when the curd sticks to the back of the spoon. It should be thick, but not too thick. You may also like these low calorie Spring Desserts. Combine butter, Truvia Baking Blend, egg yolk and vanilla in large bowl, beat until well mixed. Add flour and salt, beat well. Make indentation in center of each cookie with thumb or back of spoon. Bake for 10 – 12 minutes or until lightly golden. Remove from cookie sheets and let cool. When grating lemon, be careful not to get any white part, it’s bitter. Simmer until thickened, about 10 minutes or until mixture sticks to the back of a spoon, chill. Those look fantastic! Any idea how to make a vegan version? .-= Helby´s last blog ..Grilled Veggies =-. @Helby, No I’m sorry I don’t much about cooking vegan. But I could find out for you. Wow! Those look wonderful. I love anything lemony- – the tartness makes my mouth water. 🙂 Thanks for sharing! I would just love it if you would consider adding your recipe to my Recipe Share party this Thursday-Saturday. These look amazing, Liz! I’m sure I could easily convert them to gluten free, too. Thanks so much! .-= gfe–gluten free easily´s last blog ..Chocolate Coconut Chia “Pet” Smoothie =-. How yummy. I love lemon anything thank you for linking up. .-= Tina´s last blog ..Chocolate Chess Pie ~ Potluck Sunday =-. .-= angie´s last blog ..Ultimate Blog Party =-. 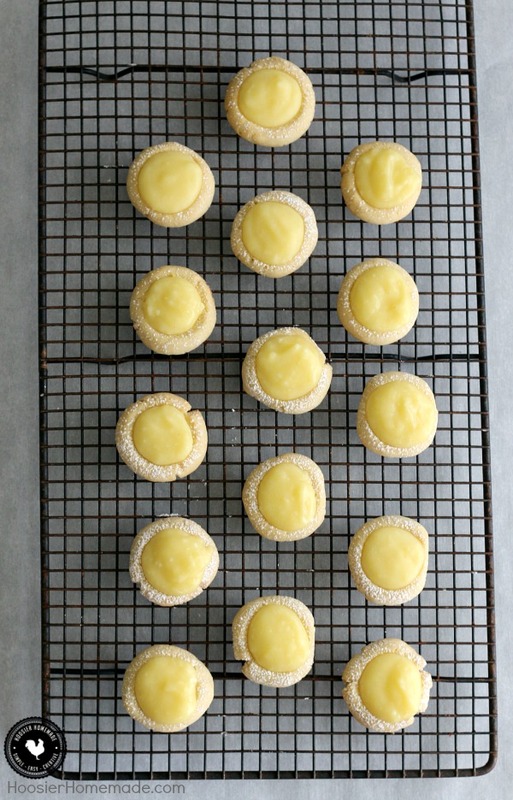 These look really good Liz….I’m a HUGE fan of lemon anything!! Thanks for linking up to I’m Lovin’ It! Have a GREAT weekend! .-= TidyMom´s last blog ..I’m Lovin’ It – Baby Shower Cookies =-. My Hubs loves anything lemon! I will give these a try. I think they will be a big hit! .-= Liz´s last blog ..My First Foodie Friday! =-. I just bookmarked these! Lemon and lime are my favorites (well, I do love chocolate and peppermint too 🙂 These are just perfect for a bridal shower or luncheon!! .-= Susan´s last blog ..And the Recipe Goes Round and Round =-. .-= pamela ponder´s last blog ..SIX DEGREES OF BLOGGING =-. I think I have to take you off of my read list – LOL You have sooooo many wonderful recipes. .-= Tammy @ Not Just Paper and Glue´s last blog ..P K Glitz April Sketch Challenge =-. Oh my Liz, they look awesome. I am adding lemons to my grocery list!! .-= Lisa@BlessedwithGrace´s last blog ..Our Reader’s Digest Article… =-. I’m with Kim on this one! lol! But that didn’t stop me from printing off the recipe! .-= Cindy´s last blog ..Funnies =-. Ok, you’ve hit my weak spot. Lemon filled ANYTHING! You’re killing me! LOL! These look terrific!